The Unity of the Universe starts from finding out the scale of the Universe / from how to measure the circumference of the Earth, how to find out how far the Moon is and how to determine distances between the planets and the Sun. It then goes on with the measurement of the stellar parallax and how big the Milky Way galaxy is. What I found curious is also how the astronomers found out the shape of the Milky Way. Sure, there are lots of spiral galaxies around, but how do you actually determine a spiral shape when you’re in the galaxy? This book was first published in 1959, so it makes for an interesting reading, as in 1959 the microwave background radiation was still 5 years in the future, so you can read both about the evolving universe theory and the steady state theory of the Universe. Plus there’s a little about the formation of the galaxies and the chemical elements, so it’s quite interesting. And naturally general theory of relativity! So there’s all the essentials in this rather short book with clear and simple illustrations and not too much mathematics is needed to understand everything. Dennis William Sciama was a British physicist, who did his doctoral thesis under Paul Dirac (you can find a review of one of his biographies “The Strangest Man” here) and is considered one of the fathers of modern cosmology. And Stephen Hawking and Martin Rees were some of his doctoral students. 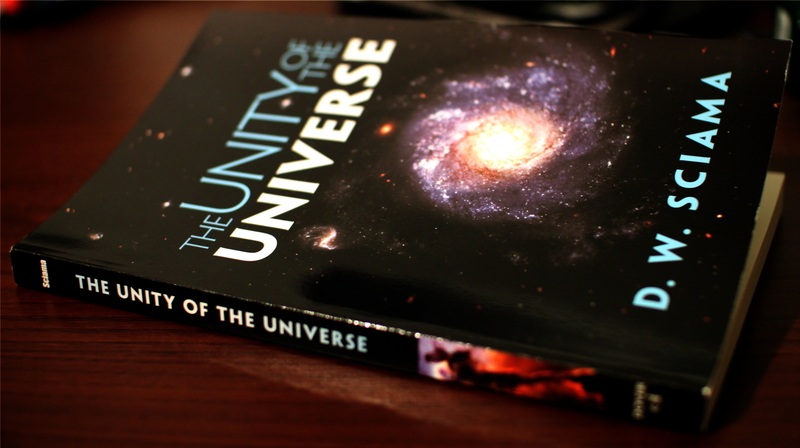 This entry was posted in Astronomy, History of Astronomy, Non-fiction and tagged astronomy books, book review, Cosmology, D. W. Sciama, The Unity of the Universe. Bookmark the permalink.